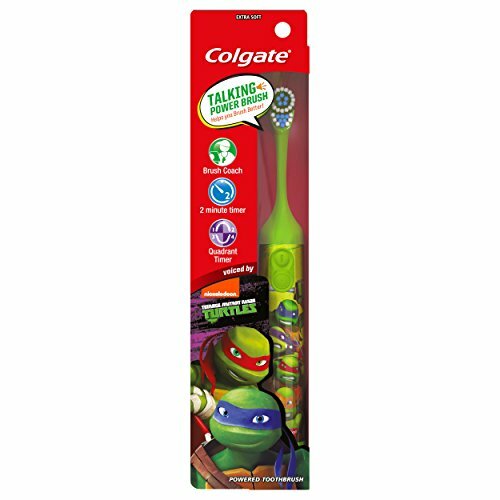 Make brushing fun with the Colgate Kids Interactive Battery Powered Talking Toothbrush, Teenage Mutant Ninja Turtles! Fight cavities with your favorite Turtles! Leonardo and Raphael will coach you through how to brush better. Character voices coach you through when to brush each quadrant of your mouth and congratulate you after 2 minutes of brushing. This interactive talking toothbrush has a small oscillating head with extra soft bristles that cleans teeth and gently sweeps away plaque. Dentists recommend brushing your teeth for 2 minutes. The item is available in different designs to encourage kids to take care of their teeth. Make Brushing Teeth Fun with the Teenage Mutant Ninja Turtles! Justice League Inspired 3pc Oral Care Bundle! Batman Powered Toothbrush, Crest Kids Cavity Protection Sparkle Fun Toothpaste & Mouthwash Rinse Cup Plus Flossers &Tooth Necklace as Visual Aid Reminder!